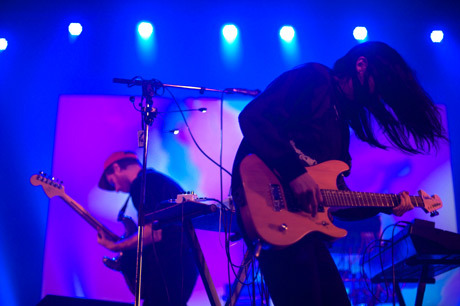 Fans wasted no time filling Theatre Rialto in anticipation for the much talked about Panda Bear set at Pop Montreal. Noise rock duo Blues Control took the stage and started things off in aggressive fashion. Guitarist Lee Cho began their set by finding the nearest speaker and viciously shredding against it, resulting in some paralyzing feedback that blended well with the wall of crunchy sounds created by other half Russ Waterhouse. The screen behind them found chaotic bursts of color melding into nothingness, a mind trip that kept the audience intrigued for the duration of their set. Things continued to build smoothly, but not by much. The well-paced and exciting early half of the band's set slowed down, making the second half of their set seem dry and repetitive. Crowd response began to dwindle, with only a small group in the front willing to get weird with Cho as she went into the crowd for a few impromptu shred sessions. A great start led to a pretty boring finish, but weirdness and engaging presence kept Blues Control floating long enough to give the crowd a pretty decent show before the main event.